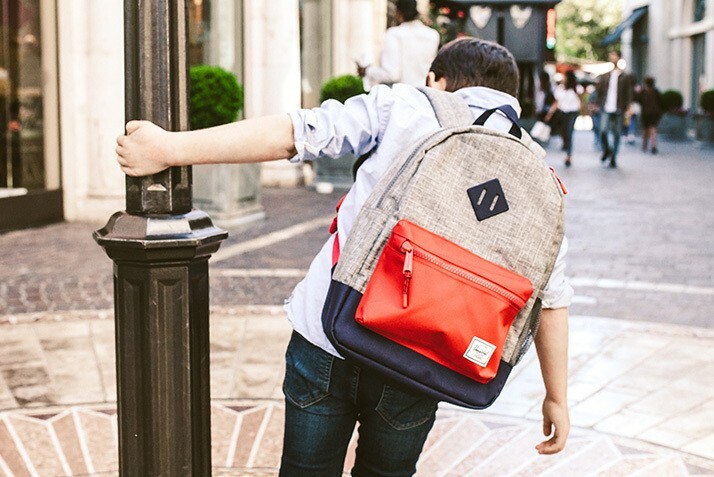 Not quite feeling inspired to jump-start your back-to-school shopping? This giveaway and these expert tips should do it. It’s officially August. In no time, students will go from hitting the beach to hitting the books, embarking on yet another school year filled with hallways and homework. To help ease the back-to-school blues, we’ve picked the brains of our most style-smart influencer students to show us how to up our A-game when shopping for the classroom. We gave two Insta-famous students the chance to win The Grove’s Back-to-School Giveaway, complete with a Herschel Supply Co. backpack, today’s leader in high-quality backpacks (straight from our pop-up, opening August 4 – 31), and a $200 gift card. We asked them to scout The Grove and hand-select this season’s must-haves for $200 and under. Below, see what made the grade for Veena Crownholm’s (@veenacrownholm) adorable second-grader, Eddie, plus fashion-travel-lifestyle-collegiate Tasha Farasaci (@tasha). 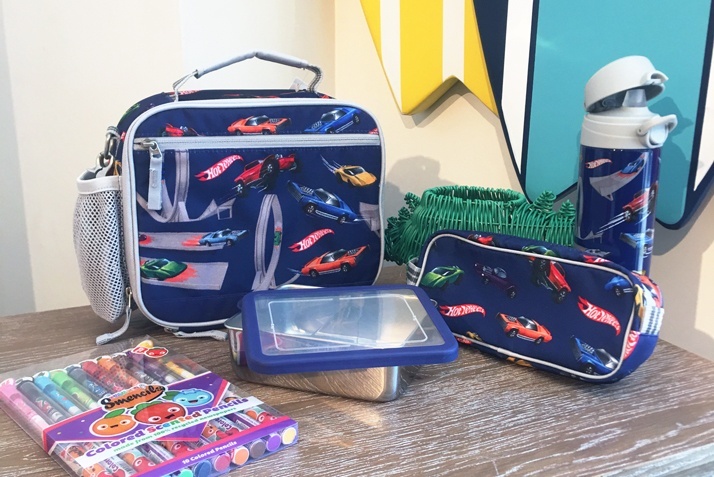 Every school year, we always go to Pottery Barn Kids to pick out a new lunch bag, pencil case and water bottle. We love the durability of the Pottery Barn Kids products as well as how well they wash. This year, we needed a new lunch box, and I know the quality of Pottery Barn so it was an easy buy. With Eddie going into second grade, there is a lot of writing, and I love that Pottery Barn Kids has such fun pencils like Smencils (colored-scented pencils). They’re useful, but really they make going back to school a little more exciting. In thinking about back to school, we also make a stop at Barnes & Noble for some good read-before-bed books. We chose the first Harry Potter book as well as Wonder, since the messaging about bullying is not only relevant for Eddie’s age, but so easily digestible for younger kids the way it was written. ­We also purchased OOLY gel crayons. First stop: Alo Yoga. 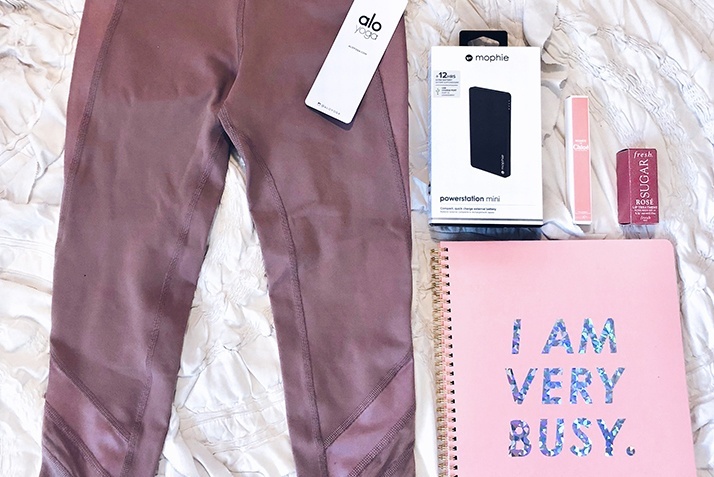 A cute pair of leggings are my go-to for class and these ones are in my favorite color (and match the backpack!). Alo Yoga is my favorite place to get leggings because they are high quality and comfortable, but also super trendy! Then, I headed to Sephora for two of my back-to-school essentials: a rollerball of my favorite perfume, Roses De Chloé, to apply in-between classes, as well as the Fresh Sugar Lip Treatment in Rosé to keep my lips moisturized, while adding the perfect amount of color. I’m obsessed with ChapStick so this is a must-have. Next up: Apple for a Mophie portable charger so I can make sure that my phone stays charged through long days of class. Last stop: Barnes & Noble for a super-cute notebook that is aesthetically pleasing and also perfect for planning out my schedule and taking notes. Take notes, readers: You too could have the chance to win our giveaway and you won’t want to miss these A+ selections—all covered by your $200 gift card. Good luck!